TGIF – an initialism for the phrase “Thank God It’s Friday”, celebrating the last day of the work/school week before the weekend. 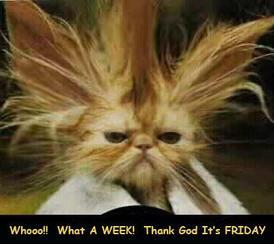 Another week finished, here comes the weekend…woo hoo. I always hope for the weekend. Most mornings when the alarm rings, I hope that it’s Friday. But this week I think I hoped a bit harder than usual. I love my job. Its hard, its busy, its stressful, but I do love it. But no matter how much I love it, I do long for the weekend. My weekends are firmly divided into Saturdays and Sundays. Saturday is the day to get so much done. Shopping, cleaning, tidying, washing cooking, socialising…as much as can be fit into a day. Saturdays can be frantic, stressful and tiring…but I love Saturday. Sunday is family day with the kids and grandkids. Sunday is a good day. I do enjoy my weekends. Even with the cooking, cleaning, tidying, shopping there is always time to spare. Time to spend doing something you wouldn’t normally be able to do during the working week. This Saturday will be a little different as I will be supporting my fellow brothers and sisters in their fight against Birmingham City Councils cuts. I hope the turn out is good. And once the weekend is over, the start of a new week. A brand new, brand spanking new, sparkling shiny new week. A new chance. A fresh start to get a step ahead…ready for next weekend. PSPO’s – an extra weapon in police armoury or another way of stigmatising young people? Don't want to miss one?